Each area of our shop is set up with vignettes that depict unique ideas for decorating this Christmas season. We feature many different artists and styles of Christmas décor, along with, of course, our Chalkware and glass ornaments. Judi has created several floor-to-ceiling wood tree silhouettes which display table settings using Juliska dinnerware and Simon Pearce glass with beautifully colored Egyptian glass ornaments hanging above to capture the light. Our front window is a real show stopper with ornaments in shades of purple, red and pink and Juliska’s “Berry & Thread” dinnerware pattern on the table. Another section of the shop is set up in a Christmas party theme with terra cotta “ gingerbread cookie” ornaments that look good enough to eat and colorful metal ornaments from Round Top Collection, that add a touch of whimsy and merriment. The trip to the German Christkindl Markets that Gary & Judi took last year, inspired them to bring many of their favorite finds to the shop. We have finely detailed reproduction Victorian glass ornaments, candy boxes by Schaller, and smokers and nutcrackers from Mueller and Ulbricht. Designs from Bethany Lowe and Byers’ Choice bring that feeling of a vintage holiday with large statement Belsnickles and Santa’s along with feather trees, detailed teddy creations that conjure up childhood memories, as well as ornaments for that special tree. A new line of snowmen from Byers’ are made in their Pennsylvania studio using fine wools from American farms. We may not have sugarplums, but we do have a delectable variety of handmade candies, chocolates, hot chocolate mixes, marshmallows, and cookies. From soft cuddly stuffed animals and finger puppets to exquisite snow globes from Reed & Barton we have special gifts for the young children in your life. 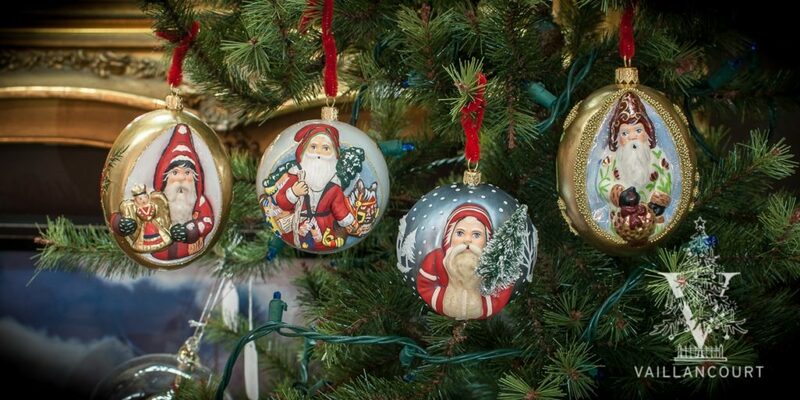 The vision of a nautical Christmas is created with ornaments from Cody Foster, April Cornell linens, prints and our own Nantucket Santa Series. We hope you will visit us this season to enjoy the festive atmosphere and be inspired to bring the decorating ideas to your own Christmas celebration.